Product #21989 | SKU TS16GUSDU1 | 0.0 (no ratings yet) Thanks for your rating! 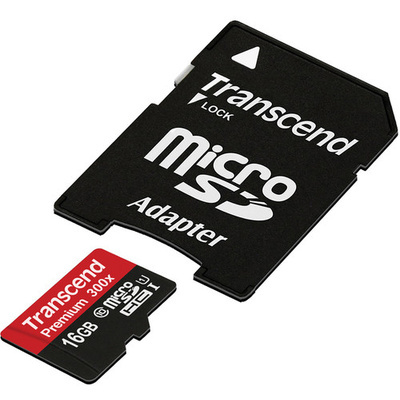 The 16GB Premium 400x microSDHC Class 10 UHS-I Memory Card with SD Adapter from Transcend features maximum read and write speeds of 60 MB/s and 20 MB/s, respectively. Its Ultra High Speed Class 1 (UHS-I) bus interface enables it to achieve these speeds, which are far greater than the 10MB/s minimum speeds guaranteed by the Class 10 rating. An SD adapter is supplied, allowing you to use the card in a full-size SDHC/SDXC slot. The card features built-in Error Correction Code (ECC) to automatically detect and fix transfer errors. It is backed by a limited lifetime warranty.